OAKLAND (California) • The Minnesota Timberwolves knew they would not be seeing National Basketball Association (NBA) All-Star forward Kevin Durant in the Golden State Warriors' line-up on Wednesday, but that was no reason for overconfidence. "They have that championship unity," Minnesota centre Karl-Anthony Towns said after a second-half Warriors explosion led to a 125-101 Golden State win in a battle of NBA division leaders. Minnesota (7-4) had moved to the top of the Northwest Division with five consecutive wins, but Golden State guards Stephen Curry and Klay Thompson ended that streak by orchestrating a 44-26 third-quarter blitz. The big quarter more than compensated for the Warriors' 13 first-half turnovers. Thompson finished with a game-high 28 points while Curry contributed 22 points, eight rebounds and eight assists as Golden State (9-3) won their fifth consecutive game to sit atop the Pacific Division. "In the third quarter, we just took care of the ball," Golden State coach Steve Kerr said. "The defence part I'm really pleased with. I think this is about our fifth straight really good defensive effort." The Timberwolves felt the Warriors' defensive pressure, particularly from the perimeter. They hit just five of 24 (20.8 per cent) from three-point range. Forward Andrew Wiggins scored 17 points while Towns had 16 points and 12 rebounds for the Timberwolves. Durant was out with a left thigh contusion, opening up playing time for the bench players. The response was 57 points - and the backups kept the turnovers down and the defensive pressure up. Minnesota, who have not made the play-offs since 2004, are 7-4. Karl-Anthony Towns and Andrew Wiggins, two overall No. 1 draft picks, put up good numbers last season, but the result was only a 31-51 team. The new piece this season is Jimmy Butler, from the Chicago Bulls, who by all accounts has fitted in with the stars to give the Timberwolves what all National Basketball Association teams covet, the 1-2-3 punch. The Cavaliers are 5-6 and tied for eighth in the East. They boast no blowout wins, but have been on the wrong end of 22-and 19-point losses (to the New Orleans Pelicans and New York Knicks). The defence has been poor, Kevin Love is having a shaky season, and Derrick Rose may not quite be fitting in the way he was expected to. After nine years without a single win in the playoffs, the Pistons are 8-3 to start the season, with wins over the Los Angeles Clippers and NBA champions Golden State Warriors on the road. Avery Bradley is providing defensive excellence, Andre Drummond is inhaling every rebound as usual, and Tobias Harris - a workaday NBA forward for six seasons - is averaging 20 points to lead the team. Once, Griffin rarely shot from beyond the arc, taking no more than 44 in any season and making no more than 12. Then last year he began to enjoy the occasional trey, shooting 38 of 113, still less than two attempts per game. This season, the Los Angeles Clippers star is taking five per game, and crucially, he's connecting 40.4 per cent of the time. Otto Porter, the fifth-year man for the Washington Wizards, is averaging career highs across the board: 17.7 points, 6.7 rebounds, 1.7 assists, 2.1 steals and 0.8 blocks, plus 57.3 per cent shooting and 52.4 per cent from behind the arc. 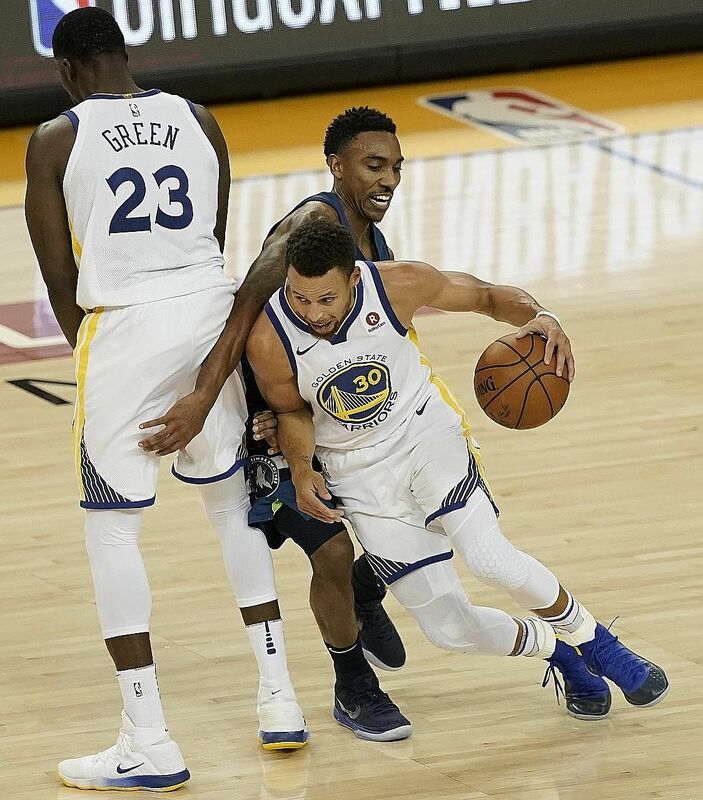 "With KD out, we needed someone to step up," forward Draymond Green said, singling out small forward Nick Young, who scored 12 points and made four steals. "His defence was incredible. He brought some energy to the game. He came up with several steals. I think we have great depth on our bench, and at all different positions. That's a weapon of ours." Timberwolves forward Jimmy Butler is a believer. "They whip that ball around, they get everybody involved," he said. "They are a really good team, obviously, with or without KD." The Boston Celtics (10-2) are showing they can win regularly despite injuries to key players too. The hottest team in the NBA won their 10th straight game by cruising to a 107-96 win over the Los Angeles Lakers (5-6) in a matchup between two of the league's most storied franchises. Australian Aron Baynes scored a career-high 21 points while Kyrie Irving overcame a poor shooting night to finish with 19 points, six rebounds and five assists. The Celtics, who are without Gordon Hayward for the season, were also missing Al Horford on Wednesday. "Until we have only four (players) left, I guess we're just going to keep playing," Boston coach Brad Stevens said. "And I don't know what you do at four, but keep playing."